My clients often send me emails and texts regarding feedback from our work together. I've put up a few here for your review. I am grateful to be working with the dynamic clients that enter my office! My clients are motivated for insight and are curious about change, they see their patterns and want to do something different to get a more positive result. As a therapist, I can't list private client names or initials, as I protect my clients privacy and personal information. I have listed contact names for public speaking and prior clinical position testimonials. "A combined group of practicing educators earning their Master's Degrees .... participated in your dynamic presentation and interactive class, "Creating Caring Communities". You brought an important dimension to this course. From your focal point, to the ice breakers, and many personal reflections; you wove the realities of demonstrating caring for our students into the classroom. You effectively link clinical counseling practices and school counseling practices along with your knowledge and understanding of the classroom. Our candidates were really touched.... You have influenced every candidate to be a better educator!" "Kelley's initiative is second to none. Her inquiries into learning and adapting new strategies and techniques, with peer sharing, has significantly benefited many students, clients and families in which she has been responsible... I firmly believe that our agency would not have been as effective or eclectic without the researched standards of our profession she has brought to our agency, including items like relative assessments, and other means of measuring client progress and outcomes... When given a task, she will initiate and develop a comprehensive plan while meeting assigned goals with minimal assistance. She is equally comfortable working with various developmental levels & age groups in the clinical counseling office or in a classroom." "For the first time in a long time, I am able to lower the anxiety that is always with me, this is amazing to me as I have been on anti-anxiety medication and have not been able to do this." 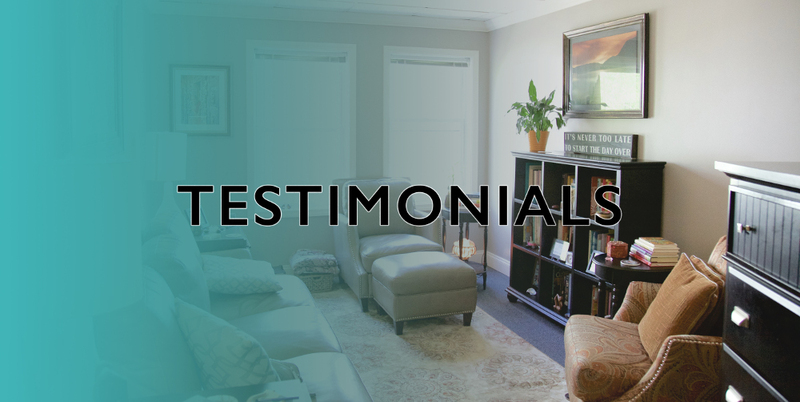 "Kelley, you are discreet, well-trained, compassionate and sensible; all of these are key factors in choosing a therapist. I would not hesitate to recommend anyone that I know to you for counseling, either as individuals, families or for marriage help. I am always impressed by your wisdom, optimism and energy." "Your positive energy and dynamic, solution-centered approach to counseling creates the safe setting for true growth for clients. Your focus is always one of maximizing strengths while building the necessary skills to meet the goals of the work being done. I have not found a more honest, hardworking, smart and empathic person with whom I have felt secure in doing the work necessary to change my life." "My wife and I actually look forward to coming into our couples sessions-it feels like some sort of pressure is released between us." "Co-Parenting weekly sessions were focused on our child, not on fighting. We had seen four therapists before we divorced and were still were unable to solve anything. Now we can at least come to a consensus in regard to our child, thank you!". "I cannot express to you how nice it feels to get these emails from you. It is like having our very own fairy God mother. I know it takes time and effort on your part on a Saturday. Your efforts are appreciated. It helps tremendously. Thank you." "Two thumbs up. Kelley is awesome, patient and kind." "Talking about our sexual issues was easier than I thought; you were very professional and informative. I value how comfortable you made us both feel". "I think you are a wonderful therapist, and I feel like I can measure my growth weekly. I am sure I would be in there twice a week, that's how much change I feel you are affecting in me, or rather guiding me in affecting myself." "It is wonderful and stimulating to see that you are passionate about helping children and families make connections." "I struggled for so long with my ADHD, glad I found you, now I have my life set up for success instead of feeling like I had no control." "Thank you for all you have done for me. I'm extremely grateful to be working with the best". "I just wanted to say thank you for all your help!! You are a wonderful person and you are great at what you do." "Manhattan is literally flooded with therapists, I chose you because you were honest with me." "We traveled a great distance to work with you because we felt we could trust you. We had researched Discernment Counseling and saw your blog posts which led us to contact you. Thank you for patiently working with us through our pain." "I really wanted to say thank you for helping me clear and get the grieving process started and somewhat behind me. You do phenomenal work which now I have the clarity of mind to see."